Microsoft has put deadline to the Windows XP support set to end on April 8th 2014. Among those hardest hit by this move are the major banks in the US and UK and their global subsidiaries whose ATMs are still running on the 12 year-old operating system. 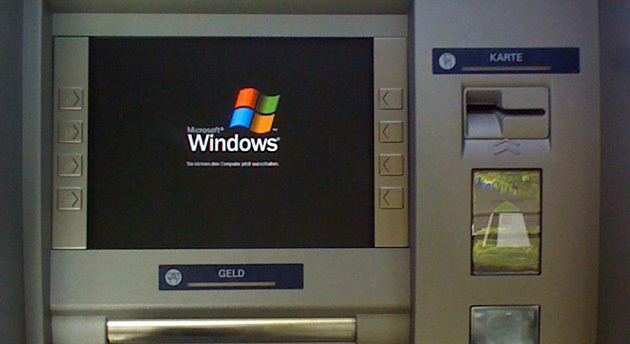 Around 95 percent of ATMs in the world are still running on Windows XP according to ATM machine maker NCR but only a third of banks will upgrade their ATMs to a newer OS before official XP support ends on April 8th, leaving many institutions little choice but to pay Microsoft for an extended contract if they still want support. “Yes, Windows XP support is ending on April 8. After April 8, 2014, Windows XP users will no longer receive new security updates, non-security hotfixes, free or paid assisted support options, or online technical content updates from Microsoft. Third parties may provide ongoing support, but it’s important to recognize that support will not address fixes and security patches in the core Windows kernel.” a spokesman for Microsoft said. Estimates suggest the big UK banks such as Barclays, HSBC, Lloyds Banking Group, Royal Bank of Scotland and Santender UK might pay up to $100 million (KES. 8.5 billion) each to keep their Windows XP support, combined with the costs to upgrade their ATMs to a more recent version of the OS. Microsoft does offer what it calls “Custom Support” for large business that includes updates for legacy programs. The machines that aren’t promptly upgraded or those that don’t run on customized support could face significant security vulnerabilities as more and more weak points in the Windows XP are uncovered. Hopefully banks will heed these warnings and upgrade as soon as possible: The malware infection rate for Windows XP is already almost six times higher than Windows 8 systems, and despite pleas from the Chinese government for Microsoft to continue support, and a warning to the Indian banking industry that details ‘major risks’ if they don’t switch operating systems, those less than tech-savvy operators may still see their ATMs face a significant threat.